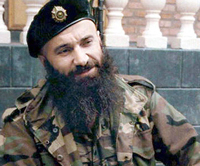 One of the leaders of Chechen guerrillas, Russia’s most wanted terrorist Shamil Basayev, has been killed. Basayev and several other terrorists were killed in the Ingushetia republic at night of July 10, the director of Russia’s Federal Security Service, Nikolai Patrushev, said in his official report to President Vladimir Putin. According to Patrushev, the Chechen guerrillas were preparing a terrorist act in the republic of Ingushetia. The FSB director emphasized that the bandits were going to use the terrorist act to put pressure on the Russian government during the G8 summit in St.Petersburg, Interfax reports. Patrushev said that the special operation to destroy Basayev became possible owing to the efficient preparatory base that had been created in the countries where Chechen terrorists were getting weapons from. Vladimir Putin congratulated all special agents who prepared and conducted the operation in Ingushetia. “This is the condign punishment to the terrorists for our children they killed in Beslan, for those terrorist acts that they committed in Budyonnovsk, Moscow and other Russian regions including Ingushetia and Chechnya ,” Vladimir Putin said. “We realize that the terrorist threat is still very high, so we must not weaken our attention at this point. We must increase and strengthen our activities in this direction,” Putin said.